The Internet went crazy on 6th January when North Korea claimed to have tested a hydrogen bomb. Although a lot of experts are looking into the matter to ascertain if that’s true or not, US is unconvinced. However, some sort of nuclear blast did happen. We decided that now would be time to explain to our readers the difference between an atomic bomb and a hydrogen bomb. Remember the bombs that ended the World War II basically? Yup, Nagasaki and Hiroshima were the victims of those bombs – they were atomic bombs. They managed to kill over 200,000 persons and the sites are still suffering from post-explosion trauma and effects. 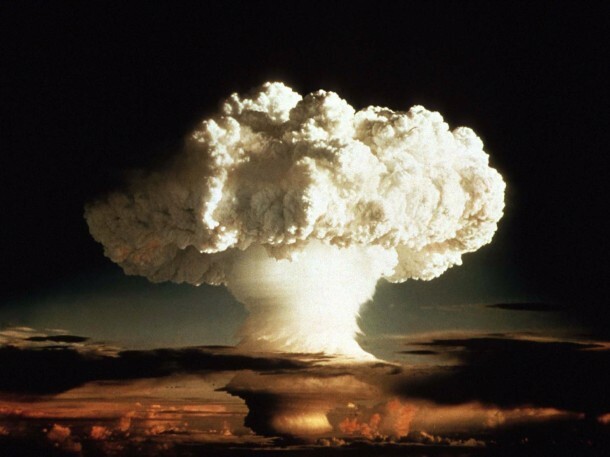 A Hydrogen bomb is known to be 1,000 times more powerful than the atomic bomb according to nuclear experts. When it comes down to H-bomb and A-bomb, the real difference lies between the methods being used to create energy. We have two known approaches; fission and fusion. The fission is the process of splitting an atom into smaller ones and the elements used are plutonium and uranium. Each split of an atom releases an immense amount of energy – the same process is used in nuclear power plants. But if you squash the atoms quickly and closer to one another, a chain reaction starts thus releasing an amount of energy that can cause quite a catastrophe – atomic bomb. There are two different models of an atomic bomb, however, the basic idea of each is fission. 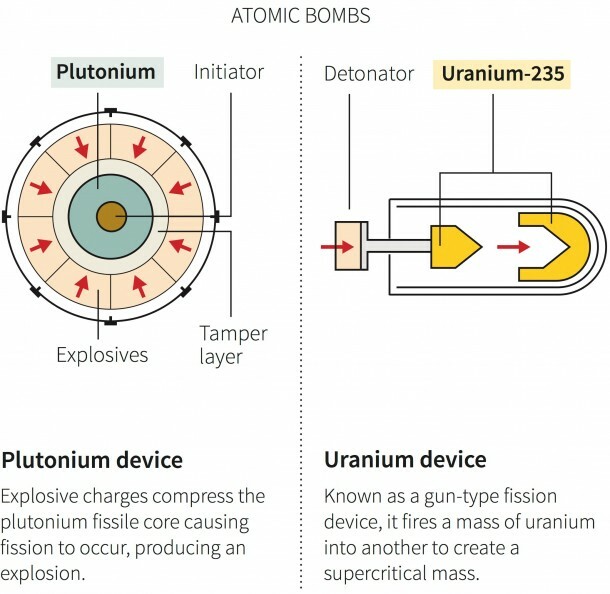 The following shows a Reuters illustration of the above-mentioned variations of an atomic bomb; implosion-type fission bomb and the gun-type fission bomb. Hydrogen bombs employ a method of creating energy that is much more extreme when compared with A-bomb. The method used is known as fusion. Fusion is the name given to the process of joining two or more atoms together via reaction. This process is what powers stars such as sun – just to give you an idea of the power of fusion. That is the reason why many experts are being skeptic about North Korea’s claims of testing a hydrogen bomb because it is quite a feat to achieve fusion on Earth. According to Yang Uk, a senior research fellow at the Korea Defence and Security Forum said that North Korea has most likely carried out the testing of a ‘boosted’ fission device and not an actual fusion device. You can see a boosted atomic bomb and a hydrogen bomb below. A unique form of ‘heavy’ hydrogen or deuterium (green) is the crucial working element for these bombs. To carry out fusion, a ton of energy is required that is achieved by detonating a fission bomb first. 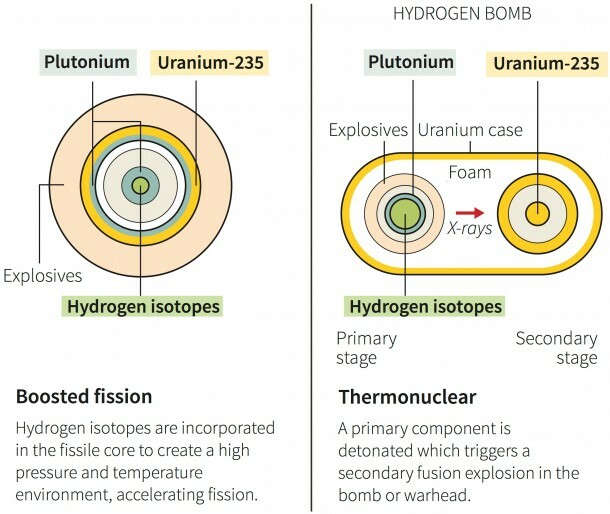 H-bombs, therefore, are two bombs actually; a fission bomb AND a fusion bomb. A boosted fission bomb unloads a blast of really strong X-ray radiations that are focused onto the fusion bomb causing it to detonate. For all of the humanity’s sake, let’s hope no one is able to make and test out an actual H-bomb.